NEW YORK (AP) — Joey "Jaws" Chestnut gulped, chomped and powered his way to a 10th title on Tuesday, continuing his record-setting reign as the chowing champion at the annual Nathan's Famous July Fourth hot dog eating contest. 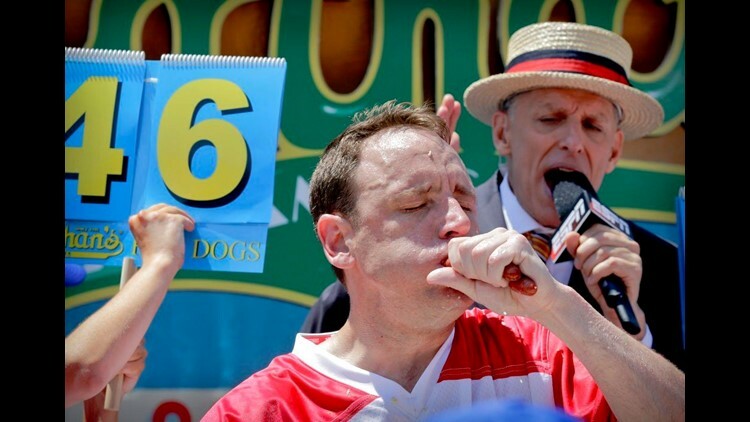 Shoving water-soaked buns and wriggling franks into his mouth on a hot, sunny day on the Coney Island boardwalk, he downed 72 dogs and buns in 10 minutes to beat his own record and hoist the Mustard Belt for a 10th time. The San Jose, California, man bested up-and-comer Carmen Cincotti, of Mays Landing, New Jersey, who ate 62 franks and buns on his 24th birthday. Miki Sudo notched a fourth straight win in the women's competition. The Las Vegas woman ate 41 hot dogs and buns to beat Michelle Lesco of Tucson, Arizona, who downed 32 franks and buns. During the men's competition, five people were taken into custody for trying to disrupt the event, police said. The people appeared to be attempting to unfold a black banner before police stopped them and took them away. People for the Ethical Treatment of Animals members had been giving away free vegan hot dogs outside the event, but spokeswoman Tricia Lebkuecher said the people arrested inside weren't affiliated with PETA. Chestnut has dominated the chowdown throwdown for years, eating 70 franks and buns last year to top his then-record and take back the title from Matt "The Megatoad" Stonie. The 25-year-old Stonie came in third on Tuesday, with 48 franks and buns. "There's no secret, I love to eat, and I love doing it, I love to win, so I had to figure out my body and push it to the limit," a sweating Chestnut said after his win. The 33-year-old said he'd hoped to down even more dogs but was leaving feeling good. Cincotti said he'd eaten a thousand hot dogs since May in preparation for his second try at the Mustard Belt. Getting to even second place is "surreal — I grew up watching this contest," he said. Meanwhile, the women's side has featured a yearslong rivalry between Sudo and record-holder Sonya "The Black Widow" Thomas, of Alexandria, Virginia. Thomas, who's 50, came in third on Tuesday with 30 dogs and buns, well shy of her record 45. Sudo told ESPN she "just came back better than ever" this year. She's 31; Lesco is 33. One of America's most outlandish July Fourth traditions, the contest dates to 1972, though the company has for years promoted what a former president acknowledged was a legendary start date of 1916. Leigh Brown and her husband brought her 11-year-old sons, Carter and Corbyn, all the way from Florida to see it. "They really wanted to come. They always watched it on TV, so it's pretty special for them," Brown said.